Product information ""Codex Humanus - The Book of Humanity" (eBook version)"
Finally, the German bestseller "Codex Humanus" is also available in the English language! Use the power of Mother Nature and protect yourself and your family...! Find out facts first hand and use the complete Power of Mother Nature in order to successfully overcome all diseases now and in the future – without any aggressive chemicals from the pharmaceutical industry! The first book, which combines all the key aspects of traditional alternative medicine (including traditional Chinese medicine TCM, Ayurveda, Central and South American indigenous medicine, etc.) with the modern achievements of orthomolecular medicine, biochemistry and gerontology, is published without censorship! · Sabotaged and concealed studies on sensational successes in prevention and therapy for every imaginable disease! · From A for allergies, Alzheimer's, ageing, arthritis, arthrosis to B for blood pressure, D for diabetes, dementia, depression to H for heart disease, C for cancer and cirrhosis and M for migraine to O for obesity (adiposity) and S for stroke, all ailments and diseases find their potent active substance here – completely free from side effects! · Clearly structured tables showing active substances and effects enable the fastest possible identification! · A controversial, unique compendium and reference work about the most important therapeutic substances and explosive study results from alternative medicine! This book takes the fear factor out of every disease..!" You can see our best-selling book "Codex Humanus" presented by the respected naturopathy expert Robert Franz in the following video! 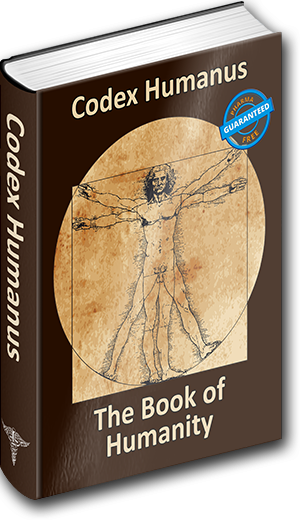 Related links to ""Codex Humanus - The Book of Humanity" (eBook version)"
Further products by Fa. Vitaminum ProLife e.Kfm.